Following Sterling's spectacularly successful launch of its children's classic novels (240,000 books in print to date),comes a dazzling new series: Classic Starts. The stories are abridged; the quality is complete. 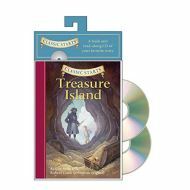 Classic Starts treats the world's beloved tales (and children) with the respect they deserve--all at an incomparable price. Pirates, buried treasure, and action aplenty--that's what's served up in this fine story, mates, and kids will eat it up. After Jim Hawkins finds the map to a mysterious treasure, he sets sail in search of the fortune. Little does he realize he's boarded a pirate ship, and that surprises and danger await him...including a meeting with the inforgettable Long John Silver. Following Sterling's spectacularly successful launch of its children's classic novels (240,000 books in print to date),comes a dazzling new series: Classic Starts. The stories are abridged; the quality is complete. Classic Starts treats the world's beloved tales (and children) with the respect they deserve--all at an incomparable price. Pirates, buried treasure, and action aplenty--that's what's served up in this fine story, mates, and kids will eat it up. After Jim Hawkins finds the map to a mysterious treasure, he sets sail in search of the fortune. Little does he realize he's boarded a pirate ship, and that surprises and danger await him...including a meeting with the inforgettable Long John Silver.